Because you love movies, you love the arts and support the arts. Because PARALLEL AMERICA is painfully timely. It plays as if it was written in response to everything that’s happening in our country today but it wasn’t. But it could be. Because it’s a clarion call for all of us to wake up and take a stand, to tell the truth, to rattle the iron fences meant to hold us in and keep us quiet. It’s not about parties or politics; it’s about all of us banding together in the same America the Founders envisioned. Because occasionally a movie will find a massive audience and defy the odds and become a phenomenon. ON GOLDEN POND, another small and intimate story that became a universal success, was the second-highest-grossing film of 1982, behind only RAIDERS OF THE LOST ARK. It brought in $119 million at the box office. Because you’ll empower hundreds of other dreamers to participate in something amazing, because Ernest Thompson offers his films as On Location Training to anyone of any age or background interested in learning any aspect of the filmmaking process, and you’ll be supporting not only one artist’s passion project but encouraging tomorrow’s writers, actors, crew and directors as well. Because it’s time. 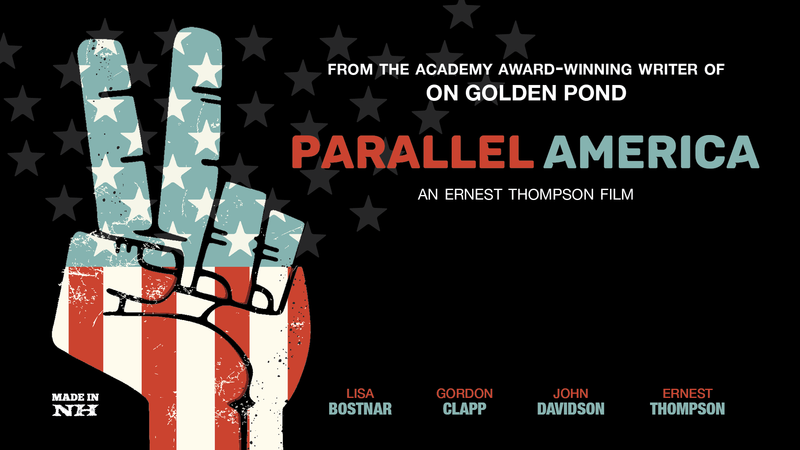 PARALLEL AMERICA is a story that needs to be told and you can make it possible. A special thanks to all of you who donated to our GoFundMe campaign. Traditional Investors are welcome, too. Write to us here or call for a prospectus outlining how you can be involved. There are still seats in the boat; we’re saving one for you. Want to be an extra? PARALLEL AMERICA is a simple story with profound implications and we need literally hundreds of colorful background performers to help us show the rest of the country and the world what an extraordinary state we live in. If you’ve always wanted to be seen on the big screen, here’s your chance. Volunteer. Every movie requires an army of dedicated foot soldiers and facilitators to keep it moving forward, drivers and production assistants, crew members and stand-ins. If you want to come work alongside some of the most accomplished and respected artists in the industry, we’d love to have you.